Bridgestone Turanza ER30 tires offer a summer performance tread design that not only provides crisp handling and control, but comes with a comfortable ride as well. Regardless of whether the pavement is wet or dry, Bridgestone has created a tread design to handle it. The tire itself features a symmetric tread pattern with tread blocks that are larger to give it better handling and steering response. On wet roads, circumferential grooves in the tread make it easier to travel with a reduced risk of hydroplaning. Two steel belts with nylon spirally wrapped around them provide more strength at higher speeds, while the polyester cord body give it a smoother ride without all of the road noise. The Turanza ER30 is often found as original equipment on many of today’s higher end vehicles such as the Porsche Cayenne, BMW 3 and 7 Series cars, as well as a host of others. Prices on the Bridgestone Turanza ER30 tires range from a low of around $140 for the 15 inch series, to upwards of $375 plus for the 19 inch series tire models. Cut your cost with Bridgestone coupon below, or find other brands discount tires coupons and reviews here. Who Are Bridgestone Turanza ER30 Tires Designed For? Bridgestone has designed the Turanza ER30 for drivers of different makes and models of sport coupes, sedans and even SUV’s, who are looking for a grand touring tire that handles well and rides nicely. 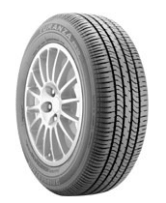 Bridgestone does not have a tread life warranty on the Turanza ER30. Other reviewers have stated they get 30,000 – 45,000 miles from the tire, with some getting less and others getting more. Bridgestone does provide for a first 1/32 inch of wear on the tire uniformity. You will also find a 5 year guarantee against materials and workmanship, with a free replacement during the first 3 years, followed by a prorated amount down to the last 2/32 inch of useable tread depth. Along with all of that is the company’s 30 day buy and try it guarantee whereby you can get a full refund or an exchange for a different Bridgestone tire if you are not satisfied.